Alfons is a collection of typeface, created by Emil Karl Bertell and published by Fenotype which comes in 8 subfamilies, a monoline script with 8 weights (from XThin to Black), two painted version, a pack of Ornaments and Extras. You can combine Alfons script with Alfons ornaments for a wide range of OpenType features that can be use for any kind of project, display use, poster, packaging, signature etc. Meet Alfons! Styles: Script, Thin, XLight, Light, Regular, Medium, Bold, XBold, Black, Printed 1, Printed 2, Brush Bold, Brush, Regular, Display Regular, Display Regular Shadow, Display Regular Print, Display Regular Shadow Print, Display Black, Display Black Shadow, Display Black Print, Display Black Shadow Print, Sans Regular, Sans Medium, Sans Bold, Sans Black, Sans Printed, Condensed Regular, Condensed Bold, Condensed Bold Printed, Serif Regular, Serif Bold, Serif Bold 2, Serif Printed, Serif Bold Printed, Serif Bold 2 Printed, Slab Regular, Slab Printed, Tiki Regular, Tiki Printed, Extras Regular, Extras Printed, Ornaments Thin, Ornaments XLight, Ornaments Light, Ornaments Medium,Ornaments Regular, Ornaments Bold, Ornaments XBold, Ornaments Black, Ornaments P1, Ornaments P2. 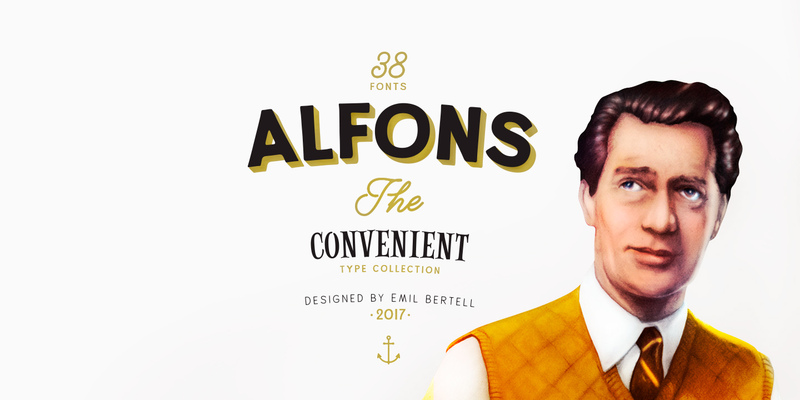 Note: “Alfons” is a trademark font name of Fenotype. Price: starting from $35 for one font to only $189 for all 50 fonts. A font description published on Monday, April 24th, 2017 in Emil Karl Bertell, Fenotype, Fonts by Alexandra that has 3,405 views.